Click swatch below to select style. Protect your business from check fraud with Securiguard® checks. Security Hologram: The hologram is a reflective image that cannot be photocopied or removed. It is a highly visible indicator of authenticity that is hot stamped into the check stock. Security Features: Other security features include visible fibers, padlock icon, heat sensitive ink, chemically sensitive paper, microprint that breaks up if scanned, a high resolution warning band and more! Security Features: Our checks feature Chemical Protection, Erasure Protection and Microprint Signature Line. Duplicate Checks: Save time and keep better records with carbonless copies of every check you write (excluding computer checks). 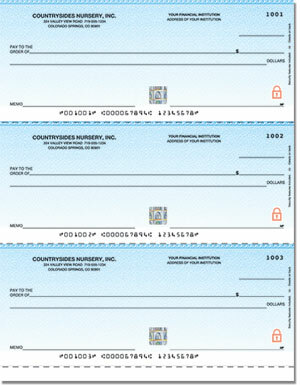 Images enhanced to show detail on the check.